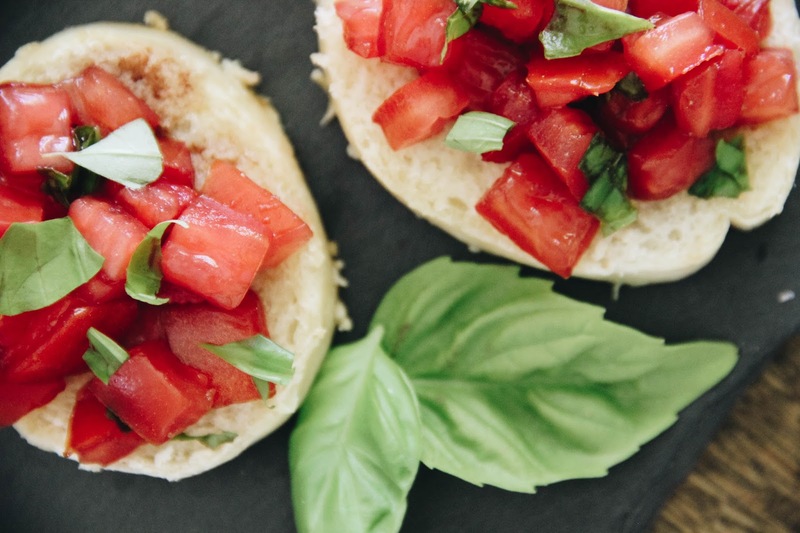 One thing I cannot get enough of right now is fresh bruschetta. 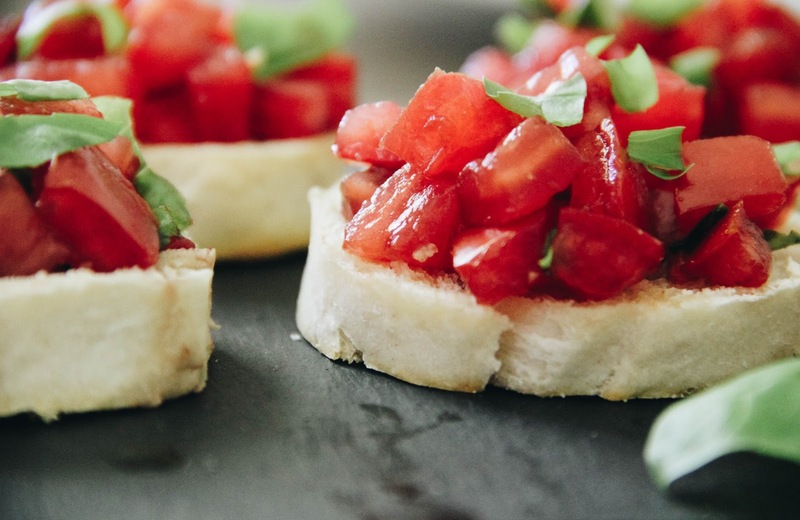 There's just something about the crunch of toasted garlic bread, the freshness of summer tomatoes, the hint of basil, and the sweetness of balsamic vinegar. It's magic in one bite, and I could eat it non-stop. This comes from someone who could go with or without tomatoes, and most often doesn't consider herself a huge fan. 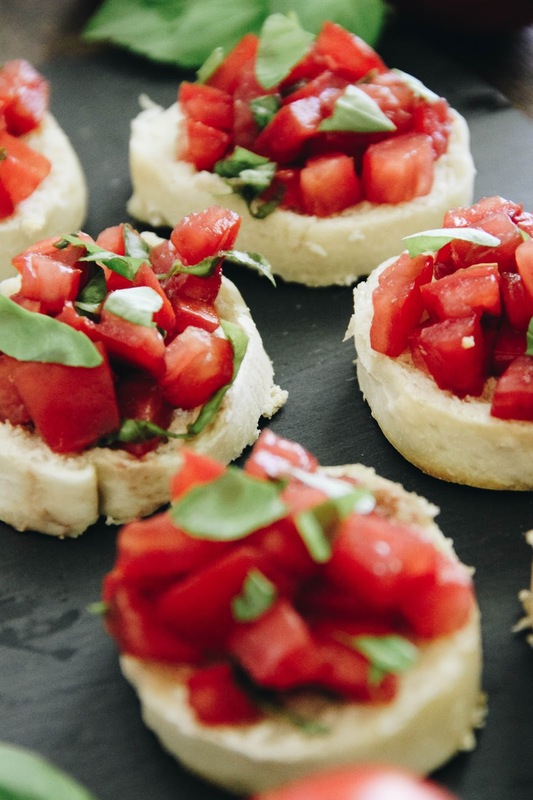 My love for bruschetta is saying a lot! I'm finding that it's perfect for weekend lunches, so add this to your weekend plans! We've been pairing it with fresh veggies dipped in ranch dip or fresh fruit. And even though I'm eating all the carbs, it feels light and just filling enough. 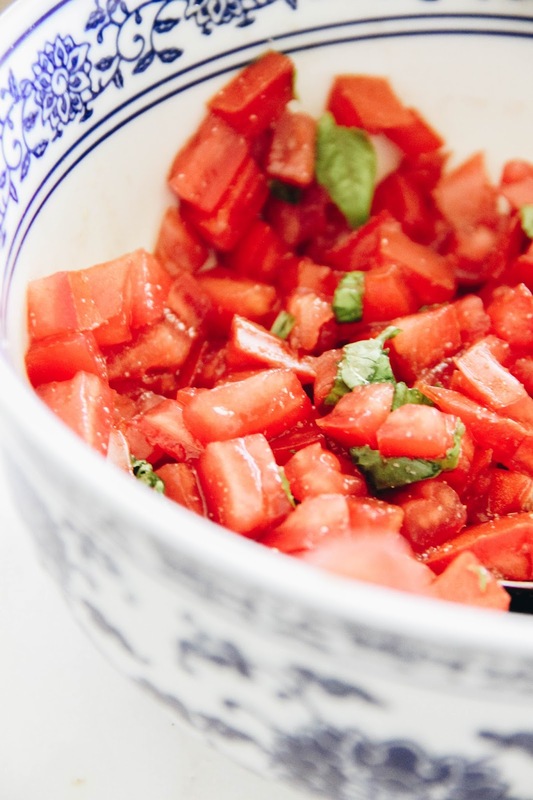 Beyond just lunch, it would be great as an appetizer or to take to a cookout. It's simple to make and packs a huge taste. Preheat the oven to 350°. Slice the baguette, about a 1/4" thickness, and layout on an aluminum foil-lined baking sheet. Slice the butter very thin and put a piece of butter in the sent of each piece of bread. Sprinkle with garlic salt. Cook for about 10-12 minutes or until the edges lightly browned. If you don't use a bake-at-home baguette, cut this time down by half or until the edges are slightly browned. Wash and de-seed the tomatoes. Dice them up and add to a bowl. Roll each basil leaf up tightly, from side to side, then cut (this gives the basil the crinkle look). Toss it into the bowl. Add the balsamic vinegar and a dash or two of garlic salt (to you taste). Stir gently, until well-combined. Once the bread is cooked, top with the tomato mixture. You can heap us as much or as little as you like. **This recipe makes 8 heavily, bruschetta-topped slice of toasted, buttery garlic bread. Heap less to make more or double the recipe to make more! p.s. Go grab some fresh basil and keep it in your kitchen window. We grabbed some at a local nursery a month or so ago, and there is nothing like picking fresh basil leaves and using them in your recipes. CANNOT get enough!